Holy Summit is an extinct volcano with various echidna ruins built upon the slopes. 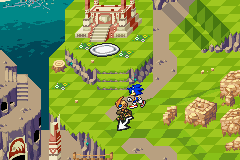 It features as the second overworld area visited in Sonic Battle for the Game Boy Advance. Sonic, Tails, and Emerl find Knuckles here, the Guardian having set up a temporary groundside residence amongst the old temples. After Tails discovers that Emerl's capabilities will increase when he absorbs Chaos Emeralds, Sonic decides to go ask Knuckles for the Emerald in his possession. In the plains at the foot of the mountain, they are waylaid by Chaos Gamma, the Doctor's strongest enforcer in Sonic Battle. After knocking out the robot, they reach Knuckles' house; but the echidna mistakes Emerl for a Phi-series robot, and attacks the team. After convincing Knuckles that Emerl isn't an Eggman mech, he agrees to relinquish his gem. Due to the non-linear nature of Sonic Battle's stages, other characters return to Holy Summit in their own episodes. Tails and Emerl have to escape Central City via the mountain when their route back to Emerald Town gets blocked by the Central Lab's security forces. Near the end of the game, Chaos appears in the volcano's frozen caldera, and the altar by Knuckles' house serves as the staging point to teleport up to the final battle aboard the Death Egg. 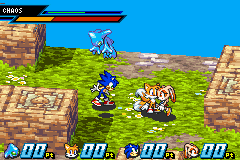 Until Emerl's episode, all fights on Holy Summit take place in the Chao Ruins arena, a small square battlefield with ruins depicting the chao and Chaos Emeralds. 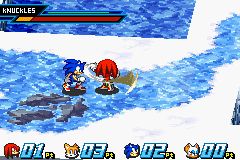 Knuckles can train Emerl here, though the area's size and arrangement of blocks make it difficult to dash away from opponents. Chaos' mute inscrutability means we never find out exactly why he pops up at the mountain summit after the Death Egg is revealed; but Emerl can train against him here, learning the "God of Destruction"'s techniques in time for the final battle against Eggman. This page was last edited on 20 December 2017, at 11:07.